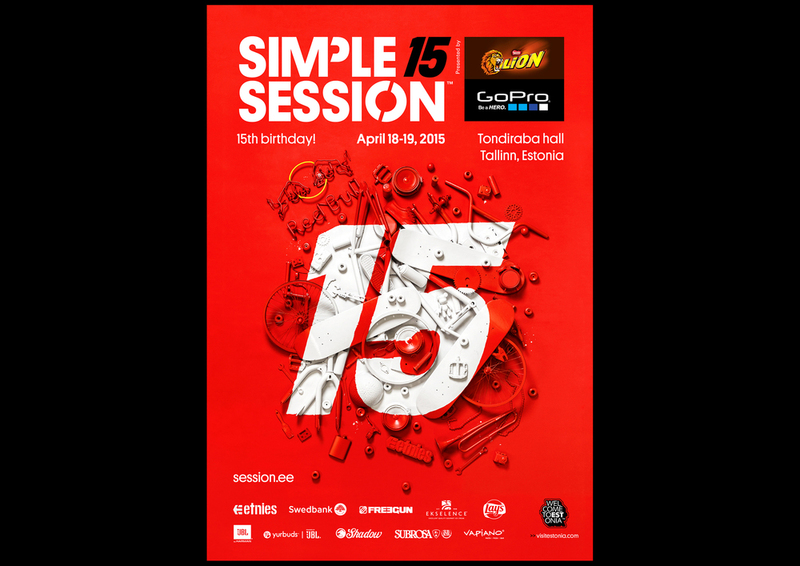 Main ad campaign for Simple Session 15 year anniversary. Simple Session is a world renowned BMX and skateboarding festival, one of the business cards of Estonia. The work emphasises the number 15 as the main communication element in the campaign. The festival turned 15 years old this year making it one of the longest-lasting event series of its kind in the whole world. The different objects relate to the event series, its disciplines, lifestyle and its sponsors but also to a party and birthday of a 15 year old kid who lives the creative life of skateboarding or BMX bikes. As the event series is mostly about having fun, then we wanted to approach the campaign in a playful way. The work process was as follows – we created a composition of themed objects, sprayed them red with removable rubber car paint. Then painted the logo number 15 on top of it with the help of a beamer and photographed the layout from the top.